lisamarcia.com: The Birth Story - It's long! The Birth Story - It's long! So most all of you already know that the birth of our baby boy Jackson, didn't go as smoothly as planned. It was filled with more drama than I care to have in a lifetime, but I wanted to share it. I'll start from Week 40. I was overdue. I was massive and starting to get contractions quite regularly. I had gone to my Dr. and they asked if I wanted to induce, to which I said no, that I'd like him to come naturally. Our Dr.'s were supportive as nothing had been wrong with Jackson at any of the appointments and his heart-rate was strong. This was Wednesday. Thursday rolled around and I had contractions for 3 hours that were about 5 minutes apart. Knowing I wanted to labor at home for most of it, I waited to go to the hospital. They ended up tapering off after the 3 hour mark, much to my she-grin. Friday morning came with the same caliber contractions, but this time they were 3 minutes apart. I was going into labor 100%. Then they stopped. These weren't little contractions. These were "don't talk to me I cant walk or stand" contractions. People told me to go to the hospital, but I stayed resilient to the fact that I wasn't wanting to be in a hospital bed for long. That night was a long and horrible night. My contractions hit hard around 10pm and stayed consistent for 4 hours. At around 2am Steven drove me to the hospital. They asked me 10,000 questions & had me sign form after form of consent. (I still can't believe they do this while you are having contractions). Unfortunately, because it was the weekend and they had been busy, I wasn't dilating fast enough for them even though my contractions were "consistent and strong" according to the nursing staff. I was being sent home. I opted to get a sleeping aide so I could at least rest because I wasn't being able to sleep. My body hadn't rested in 3 days. It was hard knowing that Monday, if he didn't come, I was to be induced. So I figured, why don't they just do it now? It's Saturday morning for gosh sakes?! I slept ALL Saturday and contractions started up again that night around 10pm. I had asked the nurses the question when I left, "What is it going to take to keep me here in the hospital since my contractions being 3 minutes apart don't cut it?" They said, "You're water will need to break." Thank goodness, at 3am on Sunday 3/13/11 my water broke and we headed to the hospital. The first thing I noticed was that I had a TON of meconium in the water. Not a good thing. My body was tired and when I got to the hospital I had to have an epidural (not my plan at all, but after 3 days of labor, my body couldn't handle it). Had I been admitted the 1st nite I went in, it was on. I was going to conquer this birthing thing. Three days of labor, no. I'm thankful I opted for an epidural because after monitoring me for 4 hours, even though I had dilated quickly, Jackson wasn't tolerating the contractions at all! They needed to get him out asap. I'm thankful they did because even getting him out with an emergency C-Section he aspirated meconium, contracted pneumonia and had to be in the NICU where he was hooked up to breathing tubes, a CPAC (full face oxygen) and a heart-rate, respiratory and oxygen saturation monitor. It was a scary time, even though I didn't really understand the seriousness of it until about day 3. I didn't get to even hold him until Day 2 around 4pm. It was the best feeling and I have Pat in the lactation dept. to thank for that. Holding him skin-to-skin brought his heart rate down to a safe rate, his oxygen saturation up and he wanted to eat. They weren't feeding him because they didn't want him to aspirate again because his breathing was so rapid due to the lungs being filled with infection, but my lactation lady fought hard. She won and I got to feed him. What do you know? 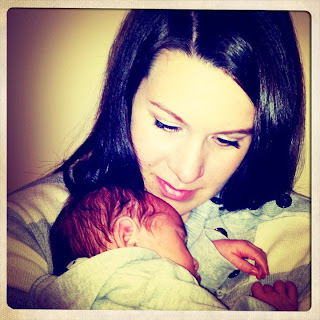 The 2nd day I had been breast-feeding him his infection score (CRP) went from 12 to 6! The Dr.'s couldn't believe it. Then I came in one night and they had a feeding tube in him because they were wanting to measure how much he was getting....I questioned why this needed to happen and why he was now going to get formula?! I was also told "No More Breastfeeding". Then came day 4. Two new things: First, they were bringing in a specialist cardiologist to investigate a heart murmur Second: he wasn't digesting ANY of his milk and it was leaving all the fluid in his tummy. This was odd to me since breast-milk is the easiest thing for them to digest. I then thought, maybe he had an obstruction. Tests later proved the heart murmur wasn't an issue and would clear itself as he grew. :) The digestion issue was severe enough though and we were told he had 12 hours to improve or they would need to ship him down to Atlanta (1 hour away) hospital. I had had it. I cried. I couldn't imagine driving down for more tests and needing to stay in a hotel. There had to be a reason this was happening in his belly! That night the NICU nurse, Lisa, was the lucky winner who got to talk with me. I liked her immediately and knew she was special. I prayed that day that God would give them wisdom as to what the problem was....and he brought Lisa. At that point, I just needed to vent & told her the entire story. She looked at me and said, "I will work my hardest to figure out what's going on and we're going to think good thoughts. We have 12 hours." She also looked at me and in a hushed tone said, "You are going to breastfeed every 3 hours. That's the best thing for this baby." This was opposite the Dr's order because they couldn't measure my milk therefore throwing off how they could determine how much was left in his belly. I was discharging the next day. Steven and I went to the hospital day after day at 9am, 12pm, 3pm, 6pm, 9pm, 12am and repeat. I was still trying to heal from my C-section. I wanted to take him home so badly. Let me say it goes against every motherly instinct to leave your child. My imagination of what "going home" would be, wouldn't be, and he would remain in the NICU for an uncertain amount of time until his CRP tests came back below 1. March 22, 2011 would be that day. At 11 days old we got to bring him home. Now 15 days old, Jack has been home for 5 days and its been wonderful. It is starting to feel real because for two week I felt like we had a child but he wasn't with us and we just fed him and had to leave. It's been a strange rush of emotions and it hit me yesterday. I finally cried just looking at him and was so thankful for everyone's prayers and support of us the last couple of weeks. We couldn't have done it without that support. It literally kept our tired and my sore body going. Special Thanks to my Mom and Dad for trekking back and forth to the hospital with us and entertaining the dogs and fixing us meals. Lynn and Eric for cooking for us and making hospital visits as well. Thank you all! We love you.